Cost Effective Solutions for Power/Data Distribution and Airflow Management. Snake Tray's expertly crafted power distribution solutions efficiently distribute power, data and air under access floors, on walls and overhead. 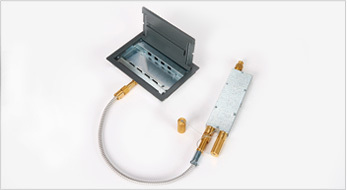 All our products are designed to install quickly and require less complicated hardware to install. We have in stock solutions and can also work with you on custom solutions. Snake Bus® Power Distribution for Access Floors – This pre-wired solution for access floors delivers 50 amps, 3 phase, 208/120 volts providing more than 15 kilowatts of power in an easy to install track and electrical whip system. 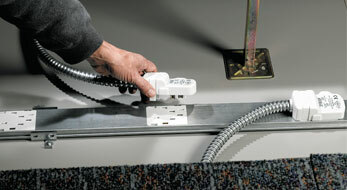 Snake Bus eliminates the need to hardwire equipment. Snake Connect® Power Distribution for Access Floors – Snake Connect® provides a complete line of 30A modular wiring devices for raised floor applications. 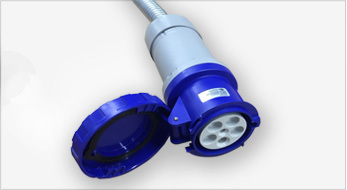 Manufactured Wiring Devices – Snake Tray’s designs and builds a series of manufactured wiring systems that give contractors the convenience and speed to complete installations on time and under budget. These devices are ideal for general office environments, trading floors, command and control centers, data centers and hospitality build outs to name a few. 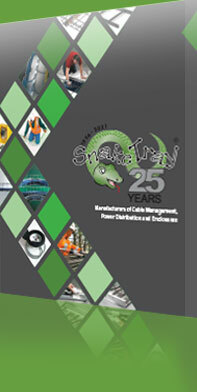 Contact Snake Tray to discuss your next Power project!